William Barnard was perhaps Newark's best-known clockmaker, probably because he was the most prolific. The earliest clock trade in Newark seems to have been monopolised by the Gascoigne family, various members of whom worked on clocks there from the mid seventeenth century. It is difficult to know just when the Gascoignes began making clocks, as the earliest members seem to have been involved initially in metal trades such as blacksmithing and later members in goldsmith work. That was the typical progression of generations of provincial metal workers, from working with coarser, heavy metals, such as blacksmiths working in iron, to finer, precious ones, such as a goldsmith working in gold. The earliest Newark Gascoigne we know to have made clocks was Owen, by whom both lantern and longcase clocks are known. He was born in 1647 and died in 1719. It is possible that his father, William Gascoigne (born 1620, died 1675), also made clocks but none are known that can be ascribed with any certainty this early. Owen's son, William, worked initially for or with his father. At least one longcase clock is documented signed 'Owen & Willm. Gascoyne, Newarke'. They seem to have preferred the signature as Gascoyn with or without the e, though records usually spell the name as Gascoigne. William presumably succeeded his father in 1719 and worked on till his death in 1740. A number of longcases are recorded by William. There were clockmakers of this same surname in London from the 1630s, but we don't know whether they were related.. The work of the Gascoignes of Newark is not that well known. In more than thirty years of recording such things, I have seen only one lantern clock made by them. This was signed ambiguously 'Gasoyn, Newarke' and dated from about 1700 or 1710. It was a full size clock (about 16 inches)of typical style and sold in Sothebys London auction rooms in December 1979. The manner of signing with a family surname only is typical of many families where father and son(s) worked together, and implies it was a joint product, which is consistent with what we assume of Owen and son William working together in that period prior to Owen's retirement or his death in 1719. One Nicholas Goddard is recorded making clocks, both lantern and longcase, in Newark from about 1700 till his death in 1740, but surviving examples of his work seem not to be numerous. The implication is that the Gascoignes monopolised the local trade, probably because of their long period of residence there. Returning to William Barnard we know he was born in Newark about 1710 (one report says 1707) and was apprenticed for seven years, probably at the usual age of fourteen, not to the local Gascoignes, as might have seemed the obvious choice, but to clockmaker Daniel Tantum, who at that time (1724) worked in Nottingham, a dozen or so miles to the west. If his birth was in 1707, that would make him seventeen years old when apprenticed, and that was unusually old for apprenticeship in those days. Why Tantum we do not know. Perhaps the Gascoignes had no need of apprentices but had a large enough workforce already. Daniel Tantum's dates are rather uncertain. He was born about 1700, the son of clockmaker Jonathan Tantum, who worked at Loscoe and later at Derby. Daniel Tantum worked in Nottingham from about 1720 at least until after 1731, in which year William Barnard would have ended his apprenticeship term. In 1732 clockmaker Jonathan Tantum of Derby died as a result of which Daniel (his son) moved to work in Derby in 1732 or 1733, presumably to take over his late father's business. Tantum worked on in Derby till at least 1744. 1. William Barnard's eight-day clock number 248 in its original oak case, seen in unrestored condition. Click for closer view. 2. 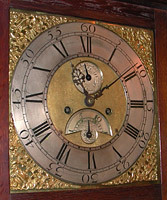 The unsigned twelve-inch dial of Barnard's clock no 248, the layout, with seconds dial and wide-mouth calendar, being typical of many of his clocks. Click for closer view. What effect the Tantum moves had on newly-qualified William Barnard we can only guess. It was normal for a clockmaker just 'out of his time' to continue to work for the same master for a further year or two, before branching out on his own or moving to work for another. Did he follow Tantum in 1733 to Derby, which was another ten miles or so west of Nottingham and therefore twenty odd miles from his home town of Newark? Or did he move back to Newark then, either to set up on his own or to work for the Gascoignes even? One report suggests that he took over Nicholas Goddard's business there, but this is unconfirmed. As it happened both Nicholas Goddard and William Gascoigne died in 1740. This left the way clear and competition free for Barnard to set up in business, and we assume this was the year he began. So William Barnard may have worked at Newark as early as 1733, or may have moved there in 1740, which is traditionally said to have been his starting date. The oldest proven date for his working there which I am aware of is the year 1744. We know this from a recently-published book by Dennis Moore, 'British Clockmakers & Watchmakers Apprentice Records 1710-1810', detailing all those makers who took official apprenticeships. William Barnard's own apprenticeship date is in there in the year 1724 when he was bound to serve Daniel Tantum. But we can also see which apprentices he took. These were: 1744 Thomas Ingerson; 1751 John Crampern; 1758 William Lowther; 1768 John Barber; 1772 Edward Crampton. From other sources we know William was still working till his death in 1785. The whole point about William's career and especially his early life is that he carried out a consistent practice which helps us put his clocks into sequence, in that he numbered each one. Numbers have been noted so far between the 300s and the 1200s. I have kept a note of all those I have come across in recent years, and these are: 525, 531, 535, 565, 566, 587, 613, 627, 706, 772, 797, 816, 819, 901, 910, 969 (dated 1769), 1084, 1086, 1216, and 1753 (though this last one may be a misreading for 753). All his clocks are said to have been numbered. His clock number is usually positioned on the front of the dial, sometimes beside his signature, but on those clocks with seconds dials (usually only eight-day ones) the number is often placed inside the seconds ring - as on the example of number 969. No 969 happens, unusually, to be dated on the dial with a plaque designating the first owner, Joseph Dixson of Waddington and the year 1769. If we had a few dated examples we might be able to form a grid to establish the approximate year from the number and to calculate his average production rate. As it is we don't know whether he began working in the early 1730s or early 1740s, and this means this rate of output could have been anywhere between about twenty four clocks and year and thirty three clocks a year. It is sometimes questioned whether those clockmakers who did number their clocks cheated a little, like by starting in William Barnard's case at number 500 - though in his particular case we do know clocks numbered in the 300s, and even, as reported below, in the 200s. It has been seen from a study of several such makers that they did not jump start their numbering, and that they really did make that many clocks. We know from other similar calculations that a clockmaker could well make a clock every two weeks, 25 clocks a year. In William's case it might work out a little higher. What we do not know is how many apprentices and/or workmen a clockmaker had at any one time. The major factor seems not to have been whether they could actually make one clock every two weeks, but whether they could manage to sell one every two weeks. A recently-discovered clock however puts the cat amongst the pigeons somewhat in that this clock is clearly unsigned on the dial. But when we look behind the dial there is the name W. Barnard engraved quite neatly. Moreover on the back of the movement is his number (248). So this is one possible part of the explanation why we see few of his earlier clocks with the lower numbers - because they have gone unrecognised as being his work. 3. 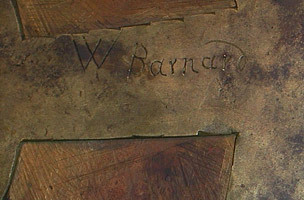 Barnard's signature is neatly engraved on the back of the dial. The town of Newark is not specified and it is just possible it was made before he moved to work in that town. Click for closer view. 4. 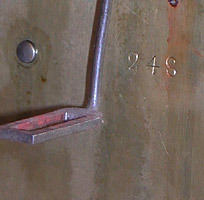 The number 248 is engraved plainly on the movement backplate. Barnard did the same with many other of his clocks. Click for closer view. But why would he indulge in this odd practice. A clockmaker was not allowed to 'sign' his work when he was still an apprentice. Nor too was he usually permitted to do this when he worked as an assistant under another master. So if William Barnard were making and selling clocks whilst in the employ of another master, he might well have left them unsigned, or at least signed them in a hidden place, as with this example. Yet could he really have made two hundred and fifty or so clocks, all signed secretly? That would be the output of something approaching ten years, and a full-time output at that. Could that be the period 1733 to 1744, his 'missing' period? As it happens he does not sign a placename alongside his hidden signature. It may be just from a lack of space, or inclination, or it may be that this clock was made before he moved to Newark. This is the only clock of his so far noted to be unsigned on the dial. But of course if many more of his clocks were unsigned on the dial, it is highly unlikely they would be recognised as his. Not many owners bother to look for a signature at the back of the dial, or for a number at the back of the movement backplate. There is another possible explanation for the signature being hidden. Some makers made clocks for others in the trade, so that they could be sold by ironmongers or hardwaremen or silversmiths, who themselves perhaps could not make clocks, but who wanted to sell them. They would have wanted to buy clocks that did not have the true maker's name on the dial. This occasional-clock-for-the-trade theory would mean that only one every now and then would fall into this unsigned but still numbered category. This seems a much more likely explanation. Yet another possible explanation exists for the unsigned dial with a hidden signature elsewhere. I can think of clockmakers such as Will Snow of Padside, Yorkshire, who was working about the same time as William Barnard, and who did exactly the same thing on some of his clocks, leaving the dial unsigned and hiding his name inside. Snow used to take his clocks to sell at local markets, where as an outsider he was prohibited from trading by local by-laws. It was much harder to track down an offender who did not display his name on his goods. Did Barnard sell his clocks at markets he was forbidden to trade in (Derby?, Nottingham?) in the period before (or even after?) his move to Newark? Is this the reason he left some unsigned. Some clockmakers occasionally obliged by putting the year of making on a clock, usually engraved somewhere out of sight on the movement plates. If a clockmaker who numbered his clocks occasionally also dated one, this would give us a sort of grid system and we could begin to learn how to date his clocks by the number. Unfortunately only one example by William Barnard is known to bear a date - 969 at 1769. If we assume he began working on his own in 1733 his production rate up to 969 was 26 clocks a year, just about what we would expect. If he did not begin till 1740, it works out about 33 a year, a bit on the high side. The likelihood is that he began work at Newark about 1733, but initially, in his earlier years there, he also sold unsigned clocks at markets further afield - for the reasons outlined above. This would make sense as from 1733 to 1740 he was competing in Newark with the long-established Nicholas Goddard and William Gascoigne and may have been desperate for business at other locations. By 1740 both these men had died, leaving the local trade almost exclusively to Barnard, and thus removing the need for him to trade elsewhere. If he did date any of his other clocks, this has so far escaped being recorded. Perhaps future owners will note down such things as a year-of-making date, or restorers will do so, who are far more likely to see such things when the clock is stripped down for servicing.